Barn Conversion 3 bedrooms sleep 6 suitable for those who are less mobile near Stratford. A warm welcome to the Granary which is on Oaks Barn Farm. The Granary is a newly converted, handsome, period, red brick detached barn conversion set in a quiet rural location with access to delightful countryside walks. 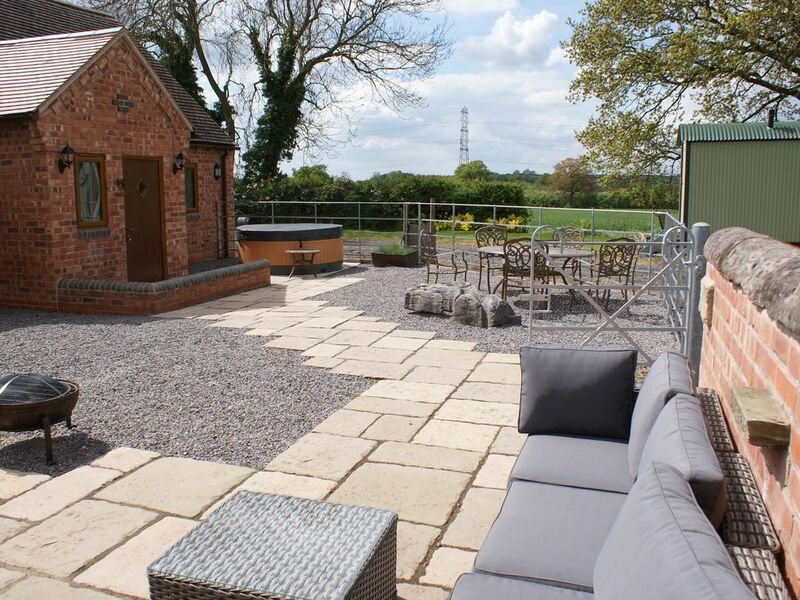 The stylish and sympathetic barn conversion, took place in 2016 and is located across from the principal house and is set within a private red brick walled garden, where you will find the newly purchased salt treated hot tub and quality garden furniture along with a charcoal bar-b-que. There is also a kadia fire bowl to ensure you enjoy your evenings in. The accommodation benefits from oak beams and comprises of a spacious open plan well equipped dining, lounge and kitchen area with granite worktops and stone floors, 1 king size bedroom is located on the ground floor along with a spacious shower room. A further 2 bedrooms are located on the first floor both have king size beds, one has its own balcony which overlooks the Malvern Hills, there is also a second shower room. The barn benefits from Biomass central heating which ensures it is very warm which is controlled by your own thermostat, electric cooker, fridge and freezer, microwave, TVs in all of the rooms and WiFi. The whole of the downstairs is on one level so is ideal for anyone who has mobility issues. Externally, the barn benefits from an enclosed gravelled garden which is where you will find your own private hot tub, this is an optional extra please see details below. The whole property is accessed through electric gates which ensures your children will remain safe whilst exploring what the farm has to offer. We currently have sheep, lambs, pigs and chickens. There are the opportunity for you collect the eggs and get involved as much as you care to. We also have a 4 by 4 all terrain vehicle and can do driving experiences, we also have facilities to do air rifle shooting. They are subject to additional costs and prior booking. Regency Cheltenham, Worcester and Gloucester are only a short drive away. With the Malvern Hills to the west and Bredon Hill to the east. Take a riverside stroll along the River Severn or a boat trip along the River Avon. The property sits within the owners farm smallholding. It is ideal for anyone looking for a relaxing break in one of England's prettiest counties and is well located for exploring Stratford-upon-Avon/Shakespeare country, Cotswolds, Birmingham, Bristol, Oxford and Bath are within easy reach for day trips. Ragley Hall and Cotswold hold major events which are held close by throughout the year such as the Game Fair, Battle of the Proms, Badminton Horse Trials, the Cheltenham Races, but to name a few. There are many superb country houses and gardens including Coughton Court, Ragley Hall, Hanbury Hall but to name a few, there lots of interesting things to do and see. The NEC and the NIA are easily accessible. Golf, horse riding, fishing and horse racing nearby. The granary benefits from excellent access to the M5, M42 and M50 motorways. Several superb restaurants can be found in local villages and of course, in Stratford-upon- Avon. Shop, pubs and restaurant within 2.5 miles. Hot tub easily accommodates 5/6 people and is available and exclusive all year round. The hot tub is filled ready for your arrival which is filtered and the salt and water is replaced each time. The cost of hire for the tub is £150, this covers the cost of 1000 litres of water, salt from the red sea, plus much more including our time! Wayne and Sue live next to the Granary with Daniel (son) Jess the cat & Jimmy their dog. Sue works full time and Wayne is hands on at the farm looking after both guests and livestock. We offer people a unique experience which includes feeding the saddle back pigs with your left over vegetable waste and if your timing is just right the opportunity to experience lambing and all the excitement of bringing new life in to the world. We offer you the opportunity to meet the animals up close to help feed them and on occasions to help round up the sheep. Children can run the fields and feel the freedom of our secure electric gated small holding, all we ask is that if you go through a gate please close it behind you, unless you want the sheep joining you for breakfast! I was fortunate to be able to buy the original unconverted barn from my mum who owns the surrounding farm land. It is really tranquil and quiet we are set back off the main road by two fields so we are easy to find but away from busy traffic. We are only 10ish minutes (depends who is driving) from Stratford upon Avon and about 35 minutes from the centre of Birmingham. You can see the deer from the Ragley estate grazing on the hill. We are in the heart of the midlands and people constantly comment that they have not had enough time to see all that they wanted to. Its a great place to come and relax and unwind. During the growing season you are able to purchase or pick your own vegetables from the farm produce stall, which also has the bare essentials for the Kandia fire bowl and b b que. We are a small business with a personnel touch, however we are mindful of those who wish to have total privacy and respect this. We have an excellent range of games and toys for all ages this includes, badminton, Croquet and many board games. For those quiet nights in there is an extensive range of CD's. Or you might like to spend the evening outside bar b queuing enjoying the outdoor furniture. Upstairs shower room to bedroom 2 & 3. Separate bathroom with shower and wc downstairs. Open plan space, comfortable lounge traditionally decorated to a very high standard with a flat screen television. A large wardrobe houses the ironing board, iron and room to hang coats. Kitchen consists of electric cooker, microwave, fridge/freezer. In the upstairs balcony bedroom. There are indoor games available in the downstairs cupboard plus an outdoor games box which can be found in the orchard. For those aspiring farmers there is a ride on John Deere tractor for those who are aged 3 years to 6 years. Adult supervision is needed as John Deere tractors are powerful machines! Private garden for your own personnel use. The ground floor is on one level, no steps. The Granary has full width doorways and a large walk in shower with low threshold. Please feel free to smoke outside only. Private salt water tub available, no chemicals are used. Available at a cost of £150; covers 1000 litres of water, salt sourced from red sea plus much more including time to empty & fill the tub. Notes on accommodation: The property is an excellent place for children with the chance to meet both sheep and pigs up close. For those really small guests, we have a high chair, travel cot and microwave. Free Wifi throughout. All bedrooms have flat screen TV's. A large selection of DVD's are located in the lounge. Also a selection of indoor and outdoor games. Outside: The Granary has its own private patio, comfy seating for those cosy evenings in. Other outdoor equipment includes patio table, chairs, barbecue. Ample off road parking. Utility Room: Facilities are available on request including washing machine. Cleaning / Towels / Linen / Maid service: Towels and linen included. Other: We provide an evening meal option please see our web site. The open plan dining area and Lounge provides a magnificent place to entertain, with oak beams. Music system provides music indoors via your IPOD or standard CD's. Excellent location and wonderfully set up cottage. We loved every minute of our Christmas stay in the Granary. High quality fittings and furnishings. The kitchen has everything for cooking every recipe we attempted from the French cookery book on site. Only suggestion would be the addition of a Nespresso machine (we bought one to use over Christmas). We made good use of the hot spa tub too despite the wintry weather! Thanks for the Christmas tree being set up for us! Thanks for the fresh eggs! Fond memories and we will certainly return. Very comfortable, very clean and loved the recycling and renewable heating set up. Only other suggestion for long stay people like us from Australia would be access to a washing machine. We could then air dry clothes on a rack in the cottage. Glad you enjoyed your Christmas in The Granary at Oaks Barn Farm and that it was suitably decorated for the festive period, decorating 3 properties plus the main farm house is no easy task but getting your comments makes it all worth while. Glad our hens played their part in supplying you with eggs, will let them know that their efforts don't go unnoticed. Our typical bookings are long weekend and full week stays, we do not supply a washing machine to each of the properties, but as per our details are able to provide a service wash. We have an on site drying room which runs off our biomass boiler, as we feel our guests would rather not be doing washing and drying in their accommodation whilst on holiday. We also take on board your coffee machine request, we have a cafetière in each of the properties but will invest some time in looking at the options. Happy New year to you also, you have our details and we would love the opportunity to welcome you back to the farm in the future. My family just spent a wonderful week in the Granary at Oaks Barn Farm. The farm is perfectly situated, remote enough to provide tranquility and solitude but at the same time an ideal hub for Stratford, Worcester and the Cotswolds and within easy reach of the M5 / M42 if you plan on travelling further afield. Alcester town is a quaint village and just 10 minutes' drive away. The property itself is idyllic; beautifully appointed and spotlessly clean. It even has its own yard area sectioned off from the rest of the farm. Sue and Wayne were the perfect hosts, treating you like family and not just paying guests. They have a thorough knowledge of the area and are on hand to offer sage advice if you're seeking somewhere specific. Even the farm dog Jimmy dropped by to visit on occasion, although funnily enough usually around breakfast time...! All in all we couldn't have asked for a more perfect stay. I wish HomeAway had a better rating system as 5 stars really doesn't tell the whole story. Unless you're a committed city dweller this property cannot fail to deliver. We offer air rifle shooting workshops. And for those learner drivers we offer a 4x4 off road experience, to enable them to become familiar behind the wheel of a motorised vehicle. Both carry an additional charge and are subject to availability. Our latest addition to the farm are 2 saddle back pigs who are making the most of the vegetable leftovers. For security and peace of mind access to the farm is via pass coded entry. Golf, horse riding, fishing and horse racing nearby. The hot tub is available for your own personal use and is located just outside the front door of the Granary. It is available at an additional cost of £150 per stay (a small additional charge is required for a 2 week stay). We empty the tub and refill it for each party coming in. The price includes 1000 litres of water, refill of salt (from the red sea) and enough Kw of electricity to heat it. Providing the cover is replaced and the jets turned off when it is not in use there will be sufficient allocated electric units to cover your stay. Children must be accompanied. We have chosen a chemical free Hot Tub which is in line with our green policy. It is a fantastic place to sit at night watching the stars. The nearest airports are Birmingham International approximately 35 miles and Coventry approximately 28 miles . A car is essential. An ideal centre from which to explore the Midlands, the Cotswolds and Shakespeare Country with its rich tapestry of culture, superb country houses and gardens and lots of interesting things to do and see. It is ideally positioned 8 miles from Stratford-upon-Avon, 12 miles from Evesham, 13 miles from Worcester, 18 miles from Warwick, 24 miles from NEC, and 30 miles from Cheltenham. It is only 3 miles from the village of Inkberrow and 3 miles from the market town of Alcester. The well known town of Stratford-upon Avon is 10 minutes away. Village shop 3 miles, a whole host of pubs can be found in the market town of Alcester with a wide variety of restaurants. The NEC and the NIA are easily accessible. Booking Notes: At the point of booking 50% deposit is required, the balance is due 8 weeks before your holiday. An additional bed can be introduced at a cost of £50 which includes the bedding. The hot tub is available for your own personal use and is located just outside the front door of the Granary. It is available at an additional cost of £150 per stay (a small additional charge is required for a 2 week stay). We empty the tub and refill it for each party coming in. The price includes 1500 litres of water, refill of salt (from the red sea) and enough Kw of electricity to heat it. Providing the cover is replaced and the jets turned off when it is not in use there will be sufficient allocated electric units to cover your stay. Children must be accompanied. We have chosen a chemical free Hot Tub which is in line with our green policy. It is a fantastic place to sit at night watching the stars. Changeover Day: Flexible. Notes on prices: Weekends from Friday to Sunday - Price on application as these are dependant on time of year and occupancy. Prices detailed are for the property which sleeps 6 people and are per week in UK pounds.